Combine Juice, Vodka, and Liqueur in a cocktail Shaker with ice. Shake until chilled, then pour into a Martini Glass. 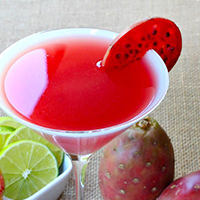 Garnish with Prickly Pear wedge.